Gary Matsumoto, a journalist based in New York City, has reported from thirty-two different countries on five continents, covered two wars and five popular uprisings, and won ten journalism awards. He has been the London Bureau Manager and Chief Foreign Correspondent for NBC Radio News; a National Correspondent for NBC's Weekend Today Show and Senior Correspondent for the Fox News Channel. As a broadcaster, he has covered events ranging from the toppling of the Communist Party in Eastern Europe to Desert Storm, the Tiananmen Square massacre to the death of Princess Diana. He has written about the anthrax letter attacks for the Washington Post and Science magazine. His 1998 article in Vanity Fair was the first to draw the connection between the anthrax vaccine and Gulf War Syndrome. Have you or anyone you know been affected by Vaccine-A? Do you agree or have an opposing opinion to the premise of this book? Share your story and perspective. "Tri-Mix" or "Triple Mix" was the U.S. Army designation in the late 1980s for the squalene emulsion adjuvant now sold by Corixa under the commercial name Ribi Adjuvant System or RAS. Scientists at Fort Detrick began working with this emulsion "vehicle" in 1987 (NIH scientists had been working with squalene emulsions since the late 1970s). As I report in Chapter Three of my book, by 1989 - a year before Operations Desert Shield and Desert Storm - Army scientists believed they had succeeded in creating a new, faster-acting anthrax vaccine that induced the same amount of immunity in guinea pigs with one shot of the new vaccine as did three shots of the licensed vaccine. The new vaccine was formulated with Tri-Mix adjuvant as well as De-Tox and Syntex Adjuvant Formula I (which were emulsified in either squalene or its more stable, hydrogenated form, squalane). The chief pharmaceutical ingredient in the new vaccine was a more highly purified protective antigen (PA) protein, or fragments or "sub-units" of PA. In parallel research, Fort Detrick also constructed various "chimeras" - genetic engineered hybrid microbes that would biosynthesize protective antigen without any trace of the other two anthrax toxin proteins. Theoretically, this would make the new vaccine less "reactogenic" (less likely to induce unpleasant side effects), but it also made it weaker. Previous data from military scientists in both the United States and Britain had already shown that the immune system responded to a wide array of Bacillus anthracis components: all three toxin proteins (PA, LF and EF), to structures called "epitopes" found on the anthrax capsule, the surface of anthrax vegetative cells and the surface of spores. By design, all of these epitopes were missing from the new vaccine, which was less reactogenic but, predictably, less immunogenic. It required a new and more powerful adjuvant: one of the new generation oil emulsions. Around 1994, Fort Detrick concluded that the non-spore forming Delta Sterne variant of Bacillus anthracis made the most efficient platform for making recombinant protective antigen, now called rPA102. Protective antigen made from this system was emulsified principally with MF59 - an adjuvant made from squalene in water, but without a bacterial component. In 1998, the British scientists at the Center for Applied Microbiological Research at Porton Down adopted the formula for the U.S. "second generation" anthrax vaccine, but added the Ribi Adjuvant System (the old Triple-Mix adjuvant) instead of MF59. According to relatively recent briefings given by Col Arthur Friedlander (U.S. Army, ret.) to senior military officers, Fort Detrick has continued to study the effects of rPA102 when combined with Tri-Mix/RAS, Syntex Adjuvant Formula and MF59. Army scientists are still testing rPA102 with alum (the only vaccine adjuvant licensed in the U.S. for human use), Walter Reed Liposomes (made with cholesterol, and sometimes with squalene and monophosphoryl Lipid A), and QS-21. The NIH-approved clinical trials with rPA102 are with alum only. The anti-squalene antibodies in retired and active duty military personnel are evidence that the Army has been acquiring safety and efficacy data for the new vaccine, combined with squalene emulsion adjuvants, by ethically dubious means. All this, and a lot more, is recounted in the book in much greater detail. Please read the whole book, not just parts of it, to fully understand the basis of the very serious charge that the Department of Defense has been conducting covert medical experiments on troops to "fast track" its new anthrax vaccine. For the past half century, peer-reviewed scientific research has documented how animals injected with oil-based adjuvants develop a variety of hypersensitive (allergic) and autoimmune diseases. They also develop cysts. This has also proven true in humans. In the 1960s, nearly a million people in England were immunized with an influenza vaccine containing an oil based adjuvant. I believe the oil was mineral oil. The manufacturer voluntarily withdrew the vaccine from the market when approximately 40 patients developed sterile (non-infectious) cysts that in some cases had to be surgically removed. I am unaware of any research showing how quickly cysts can develop after immunization with an oil adjuvant. .....Military personnel injected with anthrax vaccine containing squalene have been reporting that they developed cysts, appearing all over their bodies. Among the first to report this were Air Force personnel at Dover Air Force Based in Delaware, which had received at least four lots of anthrax vaccine containing squalene. One fellow developed cysts all over his body, including his pericardium. Another fellow developed them on his spinal cord. These cysts were similar to those in British civilians injected with the flu vaccine containing mineral oil, because they were "sterile" - they were not associated with viral or bacterial infection. Formation of Cysts from Squalene Adjuvant? GSK's proprietary adjuvant is called ASO4. It contains alum and MPL. MPL stands for monophosphoryl lipid A. The U.S. Army's proprietary (unlicensed) adjuvant developed prior to the first Gulf War for use in a second generation anthrax vaccine was called Tri-Mix or Triple Mix. Tri-Mix contained MPL (monophosphoryl lipid A) and squalene. After the war, Army scientists considered MPL to be too toxic, so they began working with Chiron Corporation of Emeryville, CA to develop an adjuvant that contained squalene and water only ... on the assumption that adjuvant toxicity with Tri-Mix was due to MPL. This assumption also proved incorrect. 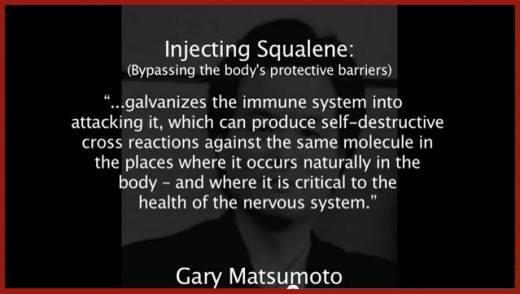 There are more than two dozen animal studies that generated data demonstrating squalene's ability to induce autoimmunity; and there is disputed evidence that nanodoses of squalene in anthrax vaccine sickened countless military personnel who received squalene-tainted vaccine during AVIP.